Door County Wedding Musicians will help you find the perfect music for your special occasion. 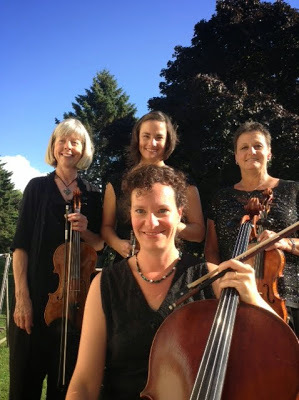 Primarily an ensemble of four musicians, 2 violins, viola and cello, "The Allegro String Quartet is a performance ensemble that plays for weddings and other special events in the Door County Area. We have performed in Door County since 2002. Made up of local professional musicians, we can help make your wedding or other event even more elegant and memorable with beautiful, classical and contemporary music. 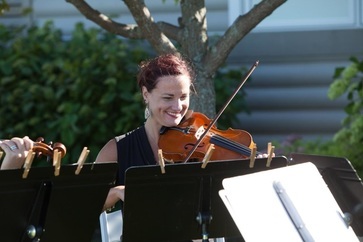 Primarily a four member ensemble with 2 violins, a viola and cello, The Allegro String Quartet is the only local string ensemble located in Door County, Wisconsin. Made up of professional musicians and music teachers, our group has a beautiful, well-balanced sound. With over 10 years as an ensemble, we are friendly and professional. 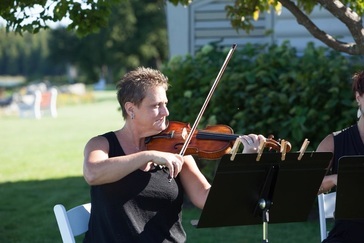 The Allegro String Quartet works closely with Door County Wedding Planners to perform for wedding ceremonies and receptions. We also play for private parties and other special events. 1st Violin-Kimbra: Kimbra has over 35 years of symphonic and ensemble performance experience as a professional violinist. She has been a freelance musician for over 25 years, now primarily in the Northeast Wisconsin area. She received a Bachelor of Music Degree with an Education Certification from the University of Iowa. She is currently a contract player with the Green Bay Symphony. Kimbra has many years of public school and private studio teaching experience and is a freelance musician with stage experience in back-up orchestras for well known musicians traveling through Iowa, Illinois, and Wisconsin. 2nd Violin-Jessica: A violinist, but also a popular dentist in the Manitowoc area. Jessica has played with the quartet as a substitute for several years and now joins the group as a permanent member. Jessica is the daughter of 1st Violinist Kimbra. Jessica is married and has two daughters. Viola-Martha: Martha is one of the founding members of the Allegro String Quartet. She teaches violin and piano in the Algoma area. She holds a bachelor's degree in education from Concordia University in Seward, Nebraska, with majors in music and special education. Martha has played with the UW-Eau Claire Symphony Orchestra and the Civic Symphony of Green Bay as well as other small ensembles. She and her husband reside in southern Door County where together they raised five sons, all string players. 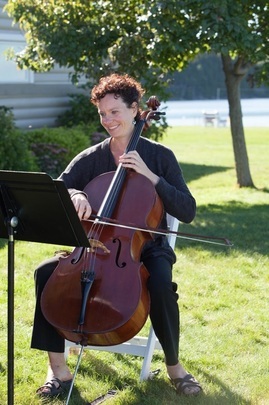 Cello-Lori: Lori is an active solo performer (a graduate of Lawrence University's Music Conservatory), teaches middle school orchestra in the Howard-Suamico School District near Green Bay, and is a substitute teacher. Lori has performed for the Peninsula Music Festival, Peninsula Players, and countless other performing venues in Door County. She is a long-time member of the Allegro String Quartet. She lives in Sturgeon Bay with her husband and two children. 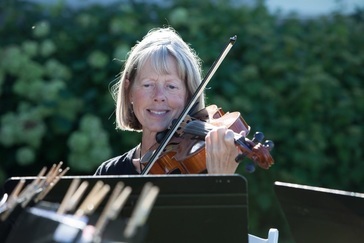 Lori is a past player with the Green Bay Symphony Orchestra, Fox Valley Symphony, and the Dubuque Symphony Orchestra, and has taught classes at the University of Wisconsin Green Bay.